Do you often feel that repetitive mouse clicking makes you even more tired while you are playing games or involving in several routine work? Here is the solution to make it easier now with AutoClick free system utility tool that can automatically perform mouse clicks by just pressing keyboard hot keys. When you click your mouse frequently while playing a game or your daily task Autoclick 2.2 tool will release your finger and save time. 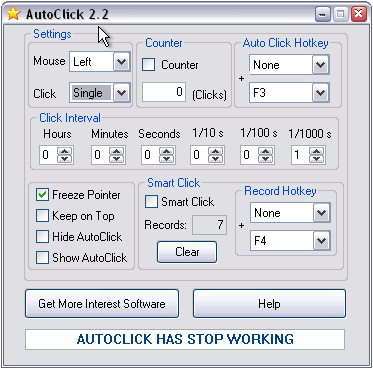 For that you need to download and run the autoclicker application then run any of the task which involves too many mouse clicks then put the pointer where you want to click, Press the default F3 function key again to stop use same F3 function.